t's Not Purple was a collaborative performance by Canadian artists, Ryan Josey and Brendan Fernandes. The performance was curated by Melinda Wang, as part of the LILAC Art Series and was a response to a 3 month mentorship Josey and Fernandes participated in through the New York Arts Practicum. "It's Not Purple is a denunciation, but also a corrective." The work explored the dynamics of Josey and Fernandes pedagogical relationship; the history of the Lighthouse Tender LILAC (the vessel on which the performance took place); and the queer history of New York's West Village, where the LILAC is currently decommissioned. In the performance, Fernandes teaches Josey to sew on his grandmother's sewing machine; while Josey teaches Fernandes to rig with his grandfather's rope. Through this intergenerational exchange their efforts spell out a poem in honour of the lesbian activist group, the Lavender Menace. 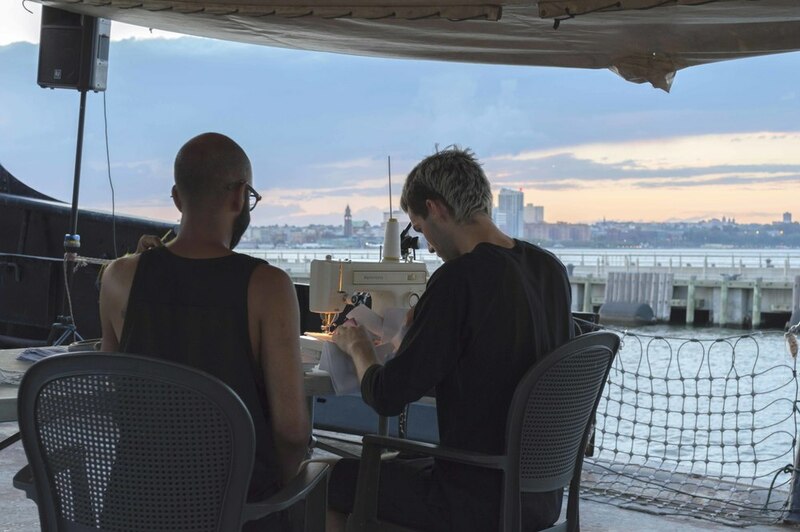 An audio installation accompanied the performance, in which recorded sounds of waves lapping were mixed with a live recording of the sewing machine amplified throughout the space. Working with LILAC crew and LILAC Preservation Project team in planning installation. Photographer, Melinda Wang. Collaboration with Brendan Fernandes, for the LILAC Arts Series, curated by Melinda Wang. Performance / Installation: sewing machine, cotton, thread, rigging, lavender incense, microphone, speakers, sound, lighting. It's Not Purple was a collaborative performance by Canadian artists, Ryan Josey and Brendan Fernandes. The performance was curated by Melinda Wang, as part of the LILAC Art Series and was a response to a 3 month mentorship Josey and Fernandes participated in through the New York Arts Practicum. It's Not Purple, 2015. Performance view. Photographer, Ariana Martinez. It's Not Purple, 2015. Take-away xerox print, 21.5cm x 28cm, edition of 150.